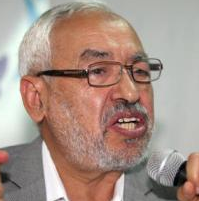 Arabic language media is reporting that Tunisian Muslim Brotherhood leader Rachid Ghannouchi has called for young people to realize that “Jihad belongs in Palestine.” IslamToday has posted Mr. Ghannouchi’s remarks on the subject taken from his Facebook page. According to the article, over the past week, Tunisian army and police have been tracking down jihadists in the Mount Chaambi border area with Algeria. On Monday Mr. Ghannouchi urged young people not to join the ranks of the jihadists, stating that “there is no jihad against a Muslim army, therefore whoever wants jihads should realize it belongs in Palestine and not in Tunis.” In 2011, Mr. Ghannouchi gave an Arabic-language interview in which he predicts the end of Israel, a viewpoint which is not surprising given that he has had a long history of ties to Palestinian extremism and calls for terrorism.